Charles Peter O'Sullivan (he restored the “0” to his name in 1973) was born in Eureka, Illinois, the second son of Peter and Alice Pifer Sullivan. 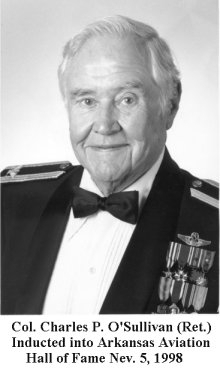 He attended Eureka College and graduated with a BS degree in Business Administration at Northwestern University, Evanston, Illinois, in 1950 and the Air War College at Maxwell AFB, Alabama, in 1955. 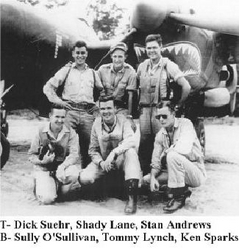 O'Sullivan or "Sully" enlisted as a Flying Cadet in February 1941 and attended Spartan School in Tulsa, OK and Randolph and Brooks Fields, Texas. He was commissioned a second lieutenant and received pilot wings on September 26, 1941 at Brooks Field and was assigned to Mitchell Field, New York. In January 1942, he left the United States for the Southwest Pacific and was assigned to the 39th Fighter Squadron, 35th Group, 5th Air Force. He served combat tours in the P-39 Bell Airacobra and P-38 Lockheed Lightning in the New Guinea area in 1942 and 1943. He flew 178 combat missions and 400 combat hours and is credited with five enemy aircraft shot down. The 39th was the first P-38 squadron in the SWPA and the first squadron to shoot down 100 enemy planes. On 20 September 1943, while on a Wewak raid, a Japanese fighter shot up Sully’s plane. He eluded the fighter and managed to crash land in a small clearing in the jungle. He survived a thirty-day trek, during which he encountered hostile natives. After a dramatic evening around a campfire, he had a "shoot out" with the natives and escaped to continue walking for three more weeks. Almost fifty years to the day, in September 1993, Sully's crashed P-38 was discovered in the New Guinea jungle. Further USAF highlights include command of a Fighter Replacement Unit; became one of first military jet pilots in the United States; was an Air Instructor in the Illinois Air National Guard; served in the capacity of Chief of Plans in the 1009th Special Weapons Squadron, Washington, D.C.; attended Air War College; served as Air Attaché in Lisbon, Portugal; was the first Wing Commander of the 308th Strategic Missile Wing (Titan II missiles) in Arkansas. Sully is married to the former Mareelee Legel of Roanoke, Illinois. They have five sons, Steven, Peter, Patrick, Don and Jon, all graduates of the University of Notre Dame. They have twelve grandchildren. Sully and Mareelee have resided in North Little Rock, Arkansas, since December 1968, and also have a winter home in Vero Beach, Florida. Charles Peter Sullivan was born in Eureka, Illinois, on July 31, 1915. In February 1941, after graduating from Northwestern University with a degree in business administration, he enlisted in the Army Air Corps Flying Cadet program. He learned to fly at the Spartan School in Tulsa, Oklahoma; Randolph Field in San Antonio, Texas; and at Brooks Field in Brooks, Texas. Upon receiving his commission and pinning on his silver wings at Brooks Field on September 21, 1941, 2d Lieutenant Sullivan was transferred to Mitchell Field, New York. In January 1942 he was shipped to Australia and assigned to fly P-39s in combat with the 35th Fighter Group’s 39th Fighter Squadron. 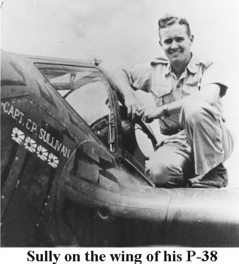 While flying a P-400 fighter (a P-39 export variant) near Port Moresby on June 17, 1942, 2d Lieutenant Charlie Sullivan scored his first aerial victory, a Japanese bomber. But it wasn't until after the 39th Fighter Squadron transitioned to P-38s that Charlie Sullivan began his steady climb to ace status: 1st Lieutenant Sullivan downed a Ki-43 near Gasmata, New Britain, on January 6, 1943; a Zero over Lae on March 3, 1943; a Zero probable over Huon Gulf on March 4; a Betty near Port Moresby on April 12; and, finally, a Ki-43 near Lae on July 26, 1943. On September 20, 1943, I was flying one of sixteen 39th Fighter Squadron P-38s that were escorting V Bomber Command B-24s on a raid against the Japanese base at Wewak. I was leading a four-plane flight. We were still south of Wewak, flying at 24,000 feet, when my plane developed engine trouble. 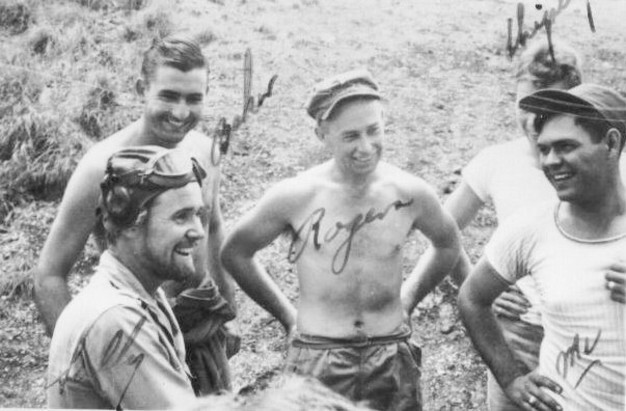 I decided to return to Port Moresby, and I left the formation, but I had not gone far before the engine began running fine - so I turned back to rejoin my squadron. Then I looked into my rearview mirror and saw an unmistakable image: that of a Japanese fighter in firing position. He was so close I didn't bother to look over my shoulder and I didn't have time to be afraid! Instinctively, I shoved the P-38 into a violent dive, dropping my auxiliary gasoline tanks as I went. It was then that I felt the shudder of bullets striking my plane. He had bit my left engine, which began spraying oil that started a smoky fire. I raced for the clouds below at speeds of nearly 500 miles per hour. The plane shuddered and shook from the strain. I looked back. I was pulling away from the Japanese fighter, but he was still stalking me. Oil began to spray on my windshield, obscuring my vision. I thought about parachuting right then, but instead I cut off the flaming engine and feathered the propeller, which stopped the fan and turned the blades so they would cut through the air with minimum drag. The fire in the left engine went out and my windshield cleared - but the stalker was still with me. At about 3,000 feet I entered fleecy clouds, but the clouds had gaps between them. I sailed through the first cloud, emerging into the clear, and saw that the stalker was still there. I went into a second cloud, then out into the clear air again. The stalker was still trailing me. To make matters worse, I was beginning to lose my precious dive speed now that I was on one engine. The third cloud loomed up. I needed to vary the program, or eventually he would nail me. So, while in the third cloud, I put my plane in a spiral and came out underneath the cloud, then flew beneath it for some time. While I was in the third cloud, I thought about how clever it would be of me if I could circle around behind the stalker and shoot him down. But Wisdom said, "What if you miscalculate and come out right in front of him? Wisdom won! I quickly dismissed that idea. When I came into the clear again my pursuer was nowhere in sight. I had eluded him! Or perhaps he was low on gas and had turned for home. As soon as I was certain I had lost the stalker, I began to think about the long flight home - at least two more hours in the air - and the necessity of climbing to at least 7,000 feet to get through a pass in the mountains. But this was not to be. The right engine began heating up and white smoke was soon trailing from it - most likely because of a Prestone leak in the coolant radiator. I decided to try the left engine again. Somehow I got it cranked up and running, so I feathered the right engine and shut it down. I flew for about five minutes before the left engine began to smoke again. So, with black smoke streaming from the left engine and white smoke streaming from the right, I decided I must either make a forced landing or bail out. I had been flying over tall trees for some time and did not wish to parachute, as I had friends who had parachuted and landed in tall trees, with the result that they sustained everything from broken legs to broken backs. I elected to set the plane down if I could. I was at the end of the road! Both engines were dead, the props were feathered, and I was sinking rapidly. As I lined up on an open area, I jettisoned the canopy, pulled down my goggles, and rode it in at about 130 miles per hour. The P-38 acted like a giant lawn mower, cutting off small trees, kunai grass, and brush. I came to a screeching, sizzling halt. The engines sounded as if they would explode. In landing, I had hit my head on something in the cockpit; it split my cloth flying helmet and gave me a deep head wound. With blood pouring from my head, I thought I was mortally wounded, but the shock spared me some severe pain. It was only a scalp wound, which I quickly bound up. My right elbow was also hurt, but not seriously. I grabbed my parachute, survival pack, and the one-man raft in the seat; I was still wearing my Mae West inflatable life vest. I took off with hardly a backwards glance, for I feared the Japanese might have seen me come down and because the engines were so hot they might explode or start a fire. I went down at high noon about 5 degrees, 30 minutes south of the Equator. The air was stifling and the silence oppressive in the kunai grass, which stood ten to twelve feet tall. A few moments earlier, I had been sailing along at about 180 to 200 miles per hour. Now I was on the ground, feeling lonely and sensing that I had been thrust back five hundred years in time. Home was nearly four hundred miles away. To the west were mountains, which I hoped to cross to an outpost mission and airstrip named Bena Bena. It took me three or four hours to slice my way through the tall, swaying grass to the shelter of some trees, a distance of probably no more than seven hundred yards. I tried cutting the kunai with my machete, but it was futile, so I high-stepped and fell forward time and time again. I finally reached the trees and shade, but I was exhausted. I found a bit of a clearing, where I cut up my parachute to make a tent and hammock of silk. Such luxury! The first night in the jungle was terrifying, because of the strange noises and shrieks of birds and small animals. It later rained almost every night starting about 1600 hours, but I was spared that first night, the only night of my travels that it did not rain. I stayed the second day among the trees, peering out frequently toward my plane, which I could not see. At the time, the Fifth Air Force's air-sea rescue efforts were meager, to say the least, especially in the interior of New Guinea. Rescue efforts on my behalf probably consisted in their entirety of instructions to all pilots: "Look for Sully somewhere down in the jungle." Indeed, they did look for me the next day - from about 25,000 feet, then went home and reported, "No sign of Sully." The following day the instructions were, "Don't forget about Sully; he's out there someplace." Flying once again at 25,000 feet, they did not see me. On the third day, the talk went to, "Too bad about ole Sully." And that's the way it actually happened! I watched for rescue planes all day from below my canopy of trees. Then I ventured out to see what was around me. Water, which I had needed badly the previous afternoon, was hardly seventy-five yards from where I slept. It was so welcome! I filled my faithful little emergency drinking can (about one-pint capacity) and ate some of my chocolate bar. I was still a bit jumpy and watched closely for Japanese troops or natives. I wasn't really frightened, but the jungle was new to me, so I felt I could not take chances. I was very lonely, but full of hope, and I wanted to get somewhere before my head injury gave me trouble. I put sulfa powder on the wound, which I bandaged with my field dressing. I slept rather well the second night, but I frequently awoke to check noises. The moon was on the wane but still quite large. On the third day, I decided I was gaining nothing staying where I was. I thought of my trip ahead and optimistically concluded I could be home in four or five days. Little did I comprehend the power of the jungle and the difficulties that lay ahead. I hid the remnants of my parachute at the edge of the kunai grass and covered or otherwise obliterated most of my camp markings. Wisely or unwisely, I did not spread my chute above the top of the kunai - I reasoned that the Japanese had as much chance of seeing it as my friends did. I felt that I was truly on my own, because I didn't think the friendlies could pluck me out of the woods. I gathered my possessions - the tent, the hammock, the one-man raft - took a heading of 135 degrees for Port Moresby, and bravely set off. When I crossed my drinking stream, I took off all my clothes and shoes to wade across the twelve-foot wide, four-foot deep run. On the other side, I dressed back up in my long-sleeved khaki shirt, long khaki trousers, woolen socks, ankle-top GI shoes, and cloth flying helmet. Then I took up my course of 135 degrees again. The going was much easier here than in the thick kunai grass; it was all trees, thickets, and some grass. At about 0900 hours, I heard a radial-engine plane. I thought it was a Japanese fighter, which were mostly radial-engine aircraft, but it turned out to be an American single-engine A-24 dive bomber, with crew of a pilot and observer or gunner. I tried in vain to start a fire in the damp underbrush. I searched for my matches in my waterproof container, and came up with a good, old farmer-type match. But the kunai grass was too wet. Frantically, I searched for tracer ammunition for my trusty Colt .45-caliber automatic pistol. The A-24 was then only a quarter of a mile from me, flying at about 100 feet. It was so close, I could see the pilot and the observer, who had his canopy rolled forward in order to see better. Moments later, the A-24 was gone, out of sigbt. It was disappointing, but not overwhelmingly so. After all, this was only my third day down. So I struggled on. The path was hard, but I found some trees that bad been chopped down some time before. This greatly encouraged me. The path led to an abandoned grass hut - an exciting discovery! My thoughts raced from one idea to another. Was this just a way station for a native hunting party? When had people last been here? I found some discarded fish bones, but it did not appear that anyone had been in the hut for some time. I continued on, crossed another small stream, then came to another shelter on the bank of another stream. I crossed this stream and continued along the path, which was marked by crocodile footprints. Losing the trail where wild pigs had rooted up the path, I returned to the last stream, set up my hammock, cleared an area, and retired for the night. I always retired at sundown, because the dangers of wandering about in the dark jungle were apparent to me. It began to rain about midnight, and the downpour continued all night. I was drenched and rose frequently to exercise by simulating skipping rope and shadowboxing until I was warm, then I went back to sleep. What an uncomfortable night it was. I suspected there was a river nearby, so I elected to leave my hammock, Mae West, one-man raft, and box of .45-caliber ammunition at my camp while I searched for the river. I intended to come back and retrieve the heavy stuff. I blazed a trail as I went along, breaking off small branches and cutting into the bark of trees to leave marks. I found the river, but when I tried to retrace my steps to my camp, I became lost, confused, and bewildered. I could not recognize my trail-blazing effort. The jungle closed in on me oppressively. I panicked. I wanted to run blindly away, anywhere -just run and run. It was a terrible, fearsome feeling that I had never experienced before or since. Somehow, faith and reason prevailed. I knelt down and prayed earnestly: "Mary, conceived without sin, pray for us who have recourse to thee. Never was it known that anyone who sought your help or intercession was left unaided." Mary was listening and interceded with God. I stood up, now calm and confident. I resolved to take a compass course, which I believed would take me back to the river. I did not deviate from the course. In about twenty minutes, I was back at the river bank, but it was not the same spot here I had first come upon the river. The jungle had won. I was not about to try to find my heavy equipment. Now my problem was getting across the river without my Mae West life vest or the raft. Undaunted, I looked for trees with which to build a raft. I began to flail at small trees with my twelve-inch machete, but the trees were tough and the job was arduous. I gave up that idea and began collecting limbs and logs from along the river bank. I tied seven or eight logs together with parachute cord and confidently set sail. It was not to be. The logs were soaked through and the raft would not fully support me, so I just lay on it, half in and half out of the water. I drifted with the current, kicking my feet for a little extra stability. All seemed to be going well; at least I was still afloat. Then I came to a bend in the river where the current quickened, and I was swept against a muddy bank about four feet above the water level. The swift current swung my raft around and it hit me in the back. I lost the raft and, like the proverbial drowning man, I frantically grasped for anything around. I kept my pistol in my right hand and above the water all the time I was flailing. Then, Providence came to my aid! I saw a vine hanging down from the side of the bank, grabbed it, and steadied myself. The makeshift raft floated merrily on, disappearing downriver. I surveyed my precarious position. I was in deep water, in the current, but the swift part of the current was narrow. I realized that if I shoved off from the bank, I would cross the swift current and soon be in shallow water. This I did, and after reaching the shallow, pebbly shore, I decided to wash my clothes. I had had enough for one day, so I prepared for night. Beneath a huge tree only a few feet from the river, I fashioned a little shelter, using sticks to support huge banana leaves that served as my roof. Then I booby-trapped my little area, using parachute cord as a cordon, hoping that any intruder would trip over my alarm system and awaken me. Branching into my river was a beautiful mountain stream, which I planned to explore the next day. Bridging the juncture of the river and the stream was a fallen tree, which I believed was used by the natives to cross the river. It rained most of the night, but my tree and banana leaf roof shelter served me quite well. I was tired and slept soundly! I awoke, ate the last square of my chocolate bar, looked to the east, and got ready to start up the mountain stream. There was a sand bank on the left of the stream that extended for a short distance and appeared to lend itself to easy walking. As I approached the sand bank, I was startled to see a solitary human footprint in the sand. Just one footprint. I looked on either side of the print for another footprint. There was none. It was baffling. I thought of when Robinson Crusoe discovered his man Friday's footprint in the sand. The footprint was pointing up the mountain stream. In the distance I detected a clearing on the side of the mountain. We had been told that the natives girdled a tree near the base, so the tree would eventually die and fall over. It was in such clearings that the natives planted their gardens. The mountain stream seemed to lead in the direction of the clearing - hopefully, a garden tended by friendly natives. We had had good luck with the coastal natives in the Port Moresby area. Indeed, several of my comrades in the 39th Fighter Squadron had been helped back to our camp by natives after being shot down. So up the middle of the sparkling stream I proceeded. The stream varied from knee - to waist -deep. The bottom was rocky and uneven, but I never fell. After proceeding up the stream for about an hour, I began to shout periodically in the hope of attracting the attention of the "friendlies." About 0900, movement on the right bank caught my attention. I stopped dead in my tracks. Gradually, the figure of a man appeared from behind the tree cover. He had a weapon, a spear or bow and arrow, which he lowered. I felt he had drawn a bead on me from behind his cover. I raised my hand and waved, smiled, and tried to appear very friendly. Under such circumstances I could be very friendly, but at the same time, my right band moved ever so close to my trusty.45, which was holstered on my right hip. I advanced very cautiously, gun hand at the ready, smiling, and trying constantly to appear relaxed and friendly. I reached the bank, which was about three or four feet above the water. The native extended his band and helped me up the bank. We went back into the trees a few feet, where on the ground lay a freshly killed wild pig. Nearby was a young native woman. My host indicated that I should sit down, which I did, and he proceeded to dress his pig. He laid the pig on its back and chopped it open through the chest cavity with a stone axe. I noticed the woman had a bunch of ripe bananas in a fiber bag. I indicated by munching actions that I was hungry, and I pointed to her bananas. My host indicated to her to give me some bananas, and she gave me two or three, which were delicious. She was very shy and giggled a little, but my host was stern and businesslike as be continued with his task. I was fascinated when be sopped up blood from the pig's chest cavity with spongy leaves and then squeezed the blood into a three - or four-inch diameter bamboo tube. I was to see more of the bamboo tube later. Soon the dressing of the pig was complete and it was obvious we were ready to depart the area. I then saw New Guinea chivalry at its best. My host - I was to learn later that his name was Tootaroo -loaded the pig on the shoulders of his mate, gathered his spear, bow, and arrows, and headed for the stream. Very shortly we were at the bank of the stream. Tootaroo took the pig from the woman's back and she got down into the water. Then Tootaroo loaded the pig on her back again. Next, he got down into the water, and I followed. We walked downstream for about fifteen minutes before coming to a path on the left side, where the bank was almost level with the water. Tootaroo and his mate started up the path, and I began to follow at a tactful and respectful distance. Suddenly, Tootaroo turned to me and pointed emphatically back down the stream, whence I came. I protested and indicated by my motions that I wished to continue with them. He shook his head angrily and again pointed downstream. By sign language it came out: "Go back downstream." I said, "No, I go with you' " and he replied, "No, you don't." To which I responded, "Yes, I do!" After a couple of these exchanges, he simply turned away and started up the path. I hesitated, then followed. I expected him to turn on me again, but he did not, though it was obvious he did not want me to come along. Quietly, we plodded on for perhaps thirty minutes before Tootaroo stopped and began to shout as if to warn someone ahead that he was bringing a stranger home for dinner. My heart sank. What should I do? I considered my options: either leave them and go back to the known loneliness of the jungle, or continue with them to an unknown but at least human company. I reasoned that if I left them, they would still know I was out there, someplace. The thought of more food and what I hoped were friendly natives won the debate. Apprehensively, I followed. Shortly, we arrived at a small, level clearing. There were old campfire remains and a strange-looking stick placed in the fork of a short vertical stick that had stuck upright into the ground. Tootaroo started a fire and cooked some pig meat in a cylindrical earthen vessel. He later placed some whole bananas in the ashes and baked them. In about a half hour, my feast was ready. Bananas have never tasted so good. Meantime, I was aware that little dark faces were beginning to appear from behind the bushes and foliage. Soon the faces materialized into bodies of men, women, and children. They approached me cautiously. Still on my best behavior, I smiled and did nothing to excite them. They were curious about all my possessions and poked at my pockets. One youth was particularly curious and wanted to see everything in my pockets, which were loaded with compasses, parachute cord, ammunition, and a small can. The can was similar to a sardine can and had contained my field bandage. The bandage was now wrapped about my bead and tied under my chin. I had my cloth flying helmet, split in the crash-landing, perched on my bead with my flying goggles still attached. I sensed that the curious boy was a little retarded, but he looked happy and his companions appeared most tolerant of him. I must have been a bedraggled-looking curiosity. More and more natives began to appear and disappear, seeming to bring back a whole new audience each time. Twice, men who were obviously chiefs arrived to look me over from a comfortable distance. The chiefs wore beaded bands around their foreheads and all the men appeared to have little sticks in their noses and ears. The men's hair was different from the bushy hair-style of the Port Moresby-area natives; it was twisted into many small, tight braids. Each time a chief or newcomer arrived or left, I was frightened. For all I knew, they would bring Japanese soldiers. The afternoon passed this way. I was the new sideshow in town. During the early part of the afternoon, I tried to determine the meaning of the strange sticks, the older fire, and a small shelter that was open on all sides. It was obvious someone had camped here before. I pointed to the shelter, fire, and sticks and, by sign language, questioned the natives. One man held up three fingers and pointed to me, as if to say that three men like me had been there. I made signs: did they go that way (toward suspected Japanese-held areas), or did they go that way (toward Australian - or American-held territory)? The native pointed down at the ground! Now there was a discomfiting thought: the three like me had not left the area; they had died or had been killed! As twilight approached, the audience, never more than ten at a time, had dwindled to five or six people. By implicit invitation, I accompanied Tootaroo, his mate, and several others into a nearby area containing two thatch-covered huts. I concluded that they did not consider me a threat, so were taking me in for the night. It was an interesting family affair. Actually, I believe these were two families of three men in all, including one chief, Tootaroo, and a new acquaintance named Sego, plus two women - Tootaroo's mate, Sego's mate, and three or four children. The other natives I had seen during the day apparently lived elsewhere. The women prepared dinner: more pig, yams baked in the ashes, and lima-type beans cooked in blood. They also got out the bamboo tube that contained the blood from the dead pig's chest cavity. After putting some herbs or leaves in, they held the tube over the open fire. Presently, when the mixture was bubbling nicely, they proceeded to shake the contents into their hands and ate it with great gusto. As we sat around the campfire circle, I was served food on a huge banana leaf. Occasionally, a dog tried to run through the circle to get a morsel of food. Eventually, we arrived at names for the major players. I explained I was Charlie, which they thought was pretty funny. Tootaroo was the native I had found with the pig, Sego was an another young man with a mate and a boy of five or six, and the chief was either Lulawai or "Headaman." It was a pleasant, light-hearted, jovial evening. After dinner, we were joined by other natives from the area. I tried to explain my presence among them. I simulated a plane (a balus in their language) flying high in the sky with engine sputtering, then crashing to the ground. I made signs to show me crashing forward in the cockpit and injuring my bead. Strangely enough, my story got through, except to my dismay they all laughed when I pointed to my head. Then one native took over and retold my story in his native tongue, accompanied by appropriate gestures. Again, they all laughed at the crash landing and my injured head. Perhaps they laughed in relief that the mighty flying balus was indeed vulnerable. They had a pet emu or cassawary, which was cute but nonetheless a pest. It circled the group around the fire, came up behind me, and began pecking my back. I tolerantly pushed it away a couple of times, but it was persistent. So I backhanded it with my right band, knocking it back a bit. My hosts loved that; they laughed merrily. Everything seemed so congenial and friendly. When it became dark, the women and children went inside a rectangular thatched hut while the men remained near the fire with me. At length, they gave me a small hollow log to sleep in, or on. It was about four feet long, and wide enough for even a very heavyset person. I lay near the fire in my log, with my right hand placed comfortingly near my holstered .45. I was alert for any strange behavior or action, but it became apparent to me I had nothing to fear. Occasionally, during the night, one or another of the men stirred and replenished the fire. It was obvious that they had to keep the fire burning. I suspect they started fires by friction or sparks from stones. I awoke each time the fire preserver got up to tend the fire. The night passed without incident. At dawn, the small village began to stir. It appeared that Sego's mate, their son, and Headaman were planning to travel. Perhaps I wanted to go with them? I made signs about departing, hoping to convey the idea that I wished for a plan or route to go home. They seemed to get the idea and mentioned several places or names of people. I copied these on the back of my map. There were such names as Masaro, Lowy Kowy, and Bena Bena. I tried to write the words phonetically, then repeated them back to Sego. I had beard of Bena Bena, which I knew was somewhere across the mountain range from my suspected location. It occurred to me that a relay system to get me home could be arranged. The names I had been given were locations or contacts along the way. This sounded encouraging, for earlier that morning I had had the sinking feeling that I would not be able to escape the area and perhaps have to spend my life in the jungle wilds. That was a sobering thought, but the more we exchanged signs, the more hopeful I became. Not wishing to waste time, I signed, "We go." Strangely enough, they were ready also, so we turned to leave the village. I suspected then that Sego, his family, and Headaman were actually returning to their own village, located some distance away. Before we left, I gave Tootaroo the small field-dressing can as a farewell gift. He received it stoically. Not too impressed, I thought. Shortly after we left Tootaroo's home, we began a rather arduous climb. I thought I was in fair shape, but I began to tire. At one point, about an hour after starting out, Headaman approached me and signed that he wanted my big machete knife. I thought he was leaving us for good and simply desired a souvenir, so I shook my head "No!" He disappeared into the trees, but he returned in about twenty minutes with freshly cut stalks of sugar cane, which we sucked on for a time. It was delicious and refreshing. I felt a bit of remorse at not giving him the knife to cut the cane for all of us. We started on again, and in about another hour we all stopped when Sego pointed out a small pitfall in the path that had been covered with light branches and leaves. It appeared to be a security measure for a nearby village. Thoughtfully, they detoured me around it, and shortly we stopped again as they shouted a warning to unseen natives that they were bringing in a stranger. In a few minutes, we arrived at the top of a lightly forested ridge. It was about noon and a most pleasant day, sunny and nice. A few locals came out to look me over, and the overall atmosphere was relaxed. When we arrived in the village, Sego cooked some food, which was unremarkable in comparison to the feast I had had the night before. It seemed to be a lazy day. I decided to rest, perhaps share another meal with them, and depart early in the morning for that faraway place called Port Moresby. The villagers left me alone, except for Sego's little son, an alert and happy child. I tried to amuse him as best I could as I took off my shirt so I could better enjoy the pleasant sunshine. I also cleaned my .45. At Tootaroo's village, I had made signs for something with which to wipe my gun, and my idea got through. I had been rewarded with fibers impregnated with lard or some other grease, which I now used. I was constantly amazed and pleased at how effective sign language could be when you really worked at it. I was enjoying myself, but my idyllic afternoon came to an abrupt end. Sego came and led me to meet two new natives, and it was as if a cool wind and dark clouds permeated the scene. Suddenly, I had a sense of impending danger. However, I tried to seem confident and cheerful as by sign language I indicated how I hoped to be relayed over the hills to friendly territory. The obvious leader of these two visitors was named Aidee, but Aidee's partner did not give his name, so I named him "Grinning One" or "Grinny." Facetiously, I thought he had cut cards early in the afternoon for my knife and won. I did not like his attitude and distrusted both of them. Standing toe to toe in the clearing, Sego and Aidee had a violent argument. Finally, Aidee grabbed two spears and thrust them violently into the ground as he appeared to read Sego the riot act. And Sego obviously acquiesced to whatever Aidee wanted of him. I was standing nearby throughout the argument, and I felt compelled to say something to ease the tension. In what I hoped was a light-hearted manner, I said, "What is the matter, Sego, did you take his spears?" Of course, I knew that the natives did not understand my words or care about my opinion. I was later to conclude that my ultimate fate was the subject of the argument, that Sego had tried to defend me, and lost. Sego appeared crestfallen as we all turned away from the scene of the argument. As twilight approached, the waning moon came out, and the villagers began to prepare dinner. Gone was the hospitality and friendliness of the previous village. I wandered about, but no one asked me to eat with them, not even Sego. I walked up to one family campfire and made signs of eating. I was no longer hungry, but I wanted to see whether they would give me food. They handed me something, but did not ask me to sit down on the ground with them. I wandered away, not knowing what to do. Aidee and Grinny suddenly appeared beside me and started a small fire. Nearby was a thatched roof hut with a very small doorway. As I sat down near the fire, facing the rising moon, Aidee and Grinny took up positions on the other side of the fire and stared at me without showing any emotion. I felt I was being stalked! had been to the coast, and he did seem to be a more worldly person than the others. As we sat around this fire, he pointed to the moon and indicated that I perhaps had arrived at the wrong time of the month and that perhaps he regretted it had worked out this way. These were only impressions, but the feeling that there was an impending threat was definitely there. After I had exhausted my song repertoire, I suppose Aidee thought it was time to move on with his plan. He and Grinny rose and slowly approached me. They sat down on either side of me, so close that they brushed my sides. This was too close and threatening for me, so I immediately stood up. I believe they were about to attempt to overcome me. As I cast about for an idea to ease the tension or provide them with reason to leave, I again noted the nearby hut and crawled through the doorway, taking with me a little grass mat the natives had given me. I crouched just inside the doorway, hoping they would go away, but this was not to be. Aidee and Grinny approached the doorway and Aidee reached inside to tug at my shoulder, a clear suggestion that I come out. Thinking that perhaps Aidee was simply envious of my attentions to Sego and his little boy, I stepped outside. Immediately, several natives, including Aidee and Grinny, closed in around me. They were carrying spears, bows, and arrows. Without anyone actually jabbing me with a spear, I was prodded, not too subtly, along a path that led up a small incline. Soon we reached a circular hut - the execution chamber? Above the doorway I could make out in the dim light a stick device that reminded me of the stick symbol I had seen the day before, at the edge of Tootaroo's village. This symbol was a forked stick embedded in the ground with another stick placed across the fork. Whatever it was, I took it as a disturbing sign. My escorts gestured that I go into the hut. I didn't see any alternative, so I bent down and entered. Four natives followed me in. One carried a firebrand and an empty - but ominous-looking-bamboo blood tube. My heart sank a little lower as all signs were most foreboding. I felt maneuvered, but no course of action came to mind. Hoping against hope that things would get better, I continued to play their game. The native with the fire brand started a small fire in the middle of the hut and another native handed me the grass mat again, suggesting by signs that I lie down and sleep, to which I replied aloud, “I always sleep sitting up.” Simply responding aloud made me more confident, although I knew they understood little beyond what I could convey by means of my limited sign language. I was about six feet from the door, wary, and sitting on my mat with my back against the wall. I realized I was in a very vulnerable position. If a melee ensued, they might block the door to prevent my escape, even if I shot some of them. When I pressed my bands against the bamboo wall at my back, I realized I could not easily break through it. The room began to fill with smoke as there was no ceiling opening. Seizing on this situation, I began to cough and wave my arms to indicate the smoke was too much for me. A native stood up and began tearing a hole in the roof to let out excess smoke. Now or never, I thought, as this had created the diversion I needed. From a crouching position, I bolted for the opening and came out of the hut just in front of the doorway. As I came out, I pulled my .45 automatic from its holster and chambered a round. The hammer was back, and the .45 was ready to fire. Then I slipped the safety switch on and dropped the .45 back in its holster. As I stood and waited for their next move, more natives appeared, so I elected not to make a run for it. Those in the hut followed me out, bringing the bamboo tube and the fire brand with them. Once again by common consent, we moved down the path away from my "execution chamber" to a rectangular hut with a porch extension that was open on three sides. There we stopped. I was escorted inside and again given my grass mat along with a firm indication to lie down. I took the mat and sat down, facing the interior of the enclosure with my back vulnerable to the outside darkness. he had the mirror, he did not have to spit the betel mess into his hand. Sego and his little boy were inside, too. The boy's job was to keep the fire going. It might have been sort of an initiation ritual for him. The boy was only about six years old and was clearly there against his wishes. He kept crying. Suddenly, Aidee took a brand from the fire and stuck it right in the child's face. The little boy stopped crying and kept up the fire real well after that. That didn't make me like Aidee any better. The contingent inside the hut included Sego, his son, Grinny, Aidee, the headman, and a lookout who sat in the back of the but. I could hear other natives rustling around outside the hut. I was afraid that if we sat there long enough, someone on the outside might strike me with a spear. If I could manage to move to the doorway of the hut, they would all be in front of me. I got up slowly, walked slowly toward the entrance, and sort of stooped over sideways by the doorway. I then took a firebrand and sort of flashed it in back of me to make sure that there was no one in back of the hut. My move placed all of them in front of me, so I was at least temporarily in command. Just to be sure, I took out my .45 and placed it across my right thigh. We sat there from about 2000 hours to about 2200. I threatened them with the strength of the Fifth Air Force: "The balus will come and boom-boom the hell out of your villages." But that didn't seem to bother them, though they did shrink down and repeat "boom-boom!" a few times. They didn't like the idea, but I guess they didn't really think the Air Force was going to get there. Next, I thought I'd try a little religion on them, thinking that the missionaries might have contacted them. Since I was convinced they were going to kill me, I didn't see any reason not to be frank about it. So I said, "God wouldn't want you to kill me." I think I spoke pretty convincingly. Aidee, who apparently had been out to the coast, muttered a word that sounded something like "Lord." But after I had gotten all through, Aidee said, "No savvy talk" I answered, "You savvy this gun don't you?" and shook the .45 right in his face. I sat there for over an hour with my gun trained on Aidee. The whole time, I snapped the safety on an off - click, click, click - to be sure he got the message. But this guy remained cool as a cucumber. After a while, the home team began to get a little anxious. The headman got up and sort of stretched, as if to show that he was tired. Then he walked toward me, indicating that he wanted to go behind me into the hut. It was pretty obvious that if he went back there I would have two fronts to cover. He got real close to me and motioned again that he wanted to go inside. I swung the .45 around on him and shouted, "Sit down!" Well, he withered right down beside me, clearly frightened. This standoff had been going on for hours. I was thinking, I'm in command - temporarily. If I can just get them in close, in sort of a semi- circle, they won't shoot through their own people. I didn't know how I was going to get out of the hut, but I didn't want them to shoot me before I did. The headman played right into my hands. He crouched right down beside me, which made Grinny unhappy. I thought that Grinny was showing some fear, so I reached out with my left hand and motioned for him to come in a little closer to protect me on the right. But before he did, he looked at Aidee, who was sitting right in the middle, sort of head-on to me. Aidee blinked his eyes. I think that meant, Yeah, go ahead and humor him. Grinny moved a little closer but kept looking over his shoulder. He was sort of a sassy little guy, and I didn't like the way be grinned. So, with the gun in my right band, I grabbed him by a shoulder with my left hand and sort of yanked him. The poor guy probably thought I was going to shoot him in the back, because he was really scared. At this point, I established a priority list of how I was going to take care of them. They all understood "Number One." I said, "Aidee, I get you number one. Grinny, I get you number two. Headaman, I get you number three." I didn't go to number four, because I didn't think it would last that long. Then I waved the .45 and described what it would do to them. Aidee sort of believed it. It all sounded rather grim, but I had to keep talking to try to make the point. Aidee was the only one who had not shown a bit of fear, but his team had not shown much initiative. Next, I motioned for Aidee to move to a position right in front of me. He was close enough that I could touch him with my left hand. I signaled, "Come in a little closer." He rose slightly and sat without moving forward. "No! Closer!" I said. I then reached out a little farther and motioned him in closer. I guess he thought I was off balance, for he came right out of his crouching position and lunged at me like a tiger. He threw me against the wall, but I came to my feet naturally. I had the gun in my right hand, but he grabbed both my wrists and pinned me back briefly. Somehow, I forced the gun down and shot him from a distance of about six inches - right through the chest. The shot blasted him clear across the room. A split-second later, the headman came at me from the left side. If he and Aidee had timed it a little better, they might have had me. The headman came in from my left and went for both my wrists. He got my left wrist and grappled for my right. I pulled my gun back and shot him in the chest from my left side, WHAM! WHAM! Two shots, one to Aidee and one to the headman, in the space of two seconds. It was practically all over. My grim prediction was almost true. I got number one, Aidee, skipped number two, Grinny, and got number three, the headman. I still remember it like it was yesterday. I can picture the dull glow from the fire, my smoking .45, and me standing there in a crouched position, like it was Custer's Last Stand. I thought they would come after me in waves, but they didn't. Instead, they ran off like a bunch of scalded dogs and left me alone. The headman staggered outside and died. I then realized that no one was left in the hut but me. I ran out to the left as fast as I could, in the same direction as the staggering headman, and cut back and made an end run, like in football. I ran full tilt to the left, then back to the center, and then I tripped in the tall grass. This probably saved my life, because if I had not fallen, I would have been still running. I slithered down into a little depression. Back at the village, the natives had lighted torches and were screaming and shouting. I could hear them answering from all the neighboring villages. I seemed to be surrounded by their war whoops. When the torches were lit, they started to come up the bill. After they found the two men I had shot, they had a mourning ceremony. They beat on the ground and wailed, sobbed, and shouted for about an hour. It was terrible to just lay there on the ground and listen. The mourning ceremony went on and on. I could see their shadows. Although I am usually optimistic, I couldn't see how I would possibly get out of there alive. As I lay there motionless with the .45 in my right hand and a fresh clip with six bullets in my left hand, I pondered the chances of my leaving alive. I knew the natives would not be kind to me after I had killed two prominent members of their tribe. I prayed some more: "Dear Virgin Mary, never was it known that anyone who sought thy help or intercession was left unaided. Inspired with that hope and confidence, I ask your intercession with God the Father, God the Son, and God the Holy Spirit." I prayed the Hail Mary, which ends with "Holy Mary, Mother of God, pray for us sinners now and at the hour of our death." The chilling thought hit me: "Now and at the hour of our death" had become one and the same for me! What could I do? Should I save the last bullet for myself - a permanent solution to a temporary problem? I agonized over this decision. My faith and upbringing had taught me that suicide was wrong and the cowardly way out. But I dreaded torture. Then I remembered somewhere in Scripture it was said that God will not permit a person to be tempted beyond his will or capability to resist, and that even Christ was tempted. So I decided not to save the last bullet for myself, but to continue to fight to the end or escape alive. It was comforting when I realized I had weathered that trial of temptation. After about an hour, the mourning ceremony stopped and the natives went down into the lower end of the camp. Everything got real quiet. No fires, no voices, nothing. It was as still as death. A little hope trickled through my veins, but at about 0200 the natives came alive again. Up the hill they strode, with torches held high. This time, the light seemed to penetrate my little hideout, and I thought surely they would see me. But they didn't. They went through the mourning ceremony again, beating sticks on the ground, and all of that. From the shadows, I spotted the figure of a woman coming toward me. It seemed as if she had guessed where I was. She walked straight toward me, closer and closer. I couldn't bring myself to shoot her, so I thought I would shoot at the ground, get up, and run. She got closer, now about two or three feet from me. I could have reached out, stretched a little, and touched her toes. She stood right over me, sobbing and wailing her heart out. After what seemed an eternity, she turned and walked back to the camp. By 0400, everything became very quiet again. It was totally dark, no fires, no moon. Dawn was coming, and I knew I had to get out before first light. With a great deal of fear and trepidation, I stood up, fully expecting to become a human pin cushion. But nothing happened, so I took a couple of steps while thinking perhaps they wanted a moving target. Still nothing happened. Then I really began to feel that I might get out of there after all. I tip-toed across an open area and climbed over a couple of little stone walls. I made up my mind to head for Port Moresby. I had two compasses. One was a luminous compass that I could read at night. Having two compasses was a great consolation, because you get to where you don't trust one compass. I ran the gauntlet, past two open huts, but nothing happened. After I got by those, I went down a path. It was beginning to get light. As I looked down the valley, I could see that a couple of natives were hunting. I immediately withdrew off the path, but as I did I stepped on a twig. It snapped, and the sound reverberated like a shot across the valley. The two hunters just froze in their tracks, like a couple of hunting dogs on point. They just stared at the spot at which they had heard the noise. They couldn't see me, but they had me pinpointed. Then one of them dropped out of sight. I knew I had to get out of there quickly, because they were going to either circle around to investigate or go back to the village to get help. I pulled off the path and took off my shoes, because I felt they had betrayed me by the noise of stepping on the twigs. I hung them around my neck and started crawling. I crawled all morning. I was in such a desperate frame of mind that I hid my shoes under some bushes because they were making a clumping sound. I put them in there neatly, like I was putting them in a closet or under a bed, as if I might come back for them later. I was determined to make it difficult for the natives to follow me. I would crawl for three minutes and listen for two minutes, then crawl again. I did this for about two hours. I figured that if they were getting close, I would hear them during my rest interval. I got to a tiny mountain brook, which was clogged with bushes and fallen trees and had several waterfalls. Remembering Boy Scout training and lore, I walked in the water to hide my tracks. About mid-morning I reached a rushing mountain stream. It took me about a half hour to decide where to cross it so as not to leave footprints on the banks. After I crossed the stream, I took off, almost running to get away from the area. My feet felt like they were cut to ribbons. I put my sulfanilamide powder from my jungle kit on them to keep them from getting infected. When it seemed certain that I had gotten safely away, I stopped to build a shelter. I rested there for a couple of days, then moved on, built another shelter, and rested again. I went on this way for about three weeks, and by then I was getting pretty weary. One time I built a big fire, hoping that someone from my squadron was still looking for me. I gathered a huge pile of logs and started a fire that burned all night, like a prairie fire. It must have burned off about half of New Guinea. In fact, I had to get down in a ditch to get away from the fire. The next day, I had to walk through miles of burned stubble. One day, I saw a shadow on the path and then noticed a figure coming toward me. It was a native woman. As soon as she spotted me, she started running away like a deer. I took off after her, but she left me in the dust. I spent a very uncomfortable night in an abandoned hut. I'm sure the natives were also uncomfortable that night, knowing I was out there. One of my few possessions was my toothbrush, which was a great consolation. I brushed my teeth, but I didn't have much to eat. I had a pamphlet that told about native foods, but it had gotten wet and the ink ran all over it, so I couldn't read it. However, I did eat some papayas and small bananas. By then, I had been barefoot for about three weeks, but I put on my socks every night, because the insects drove me wild. Without my cloth helmet, mosquito head net, flying gloves, and socks I would have been in terrible shape. One of my favorite respites each day was to climb a hill and try to figure out where I was. I wanted to get up into the mountains, but every time I got to the top of one mountain, there was just another mountain, another valley, and another mountain ahead. Finally, I left the mountains and went back down into the plains. On my way down, while contemplating the panorama and the beauties of New Guinea, I saw a glimmer of light a few miles away. It turned out to be a reflection from a small, conical hill. I walked toward it, and late in the afternoon I was able see some human figures up there. I didn't think they were natives, but I couldn't tell if they were Japanese, Americans, or Aussies. I was so desperate by this time that I thought, even if they were Japanese, I might sneak into their camp at night and steal food. The next day I homed in on the camp. I saw someone wearing an Aussie hat, but even that didn't convince me. Maybe one of those tricky Japanese was wearing an Aussie hat. I sneaked up closer and closer until I was about thirty feet from them. It was like playing hide and seek, where you come out from hiding and jump up to scare the seeker. I was so close to them that it was almost embarrassing to jump out and say "Here I am!" Finally, I came out from behind a tree and saw that they were indeed Aussies who had come down from their fortification for lunch. I just stood there and tried to think of something clever to say, but the only thing I could think of was, "Well, here's another one of those bloody Yanks. " The Aussies didn't say anything; they just looked at me in disbelief. It was kind of awkward. Later, I learned that two weeks earlier, in a skirmish with the Japanese, they had lost a second lieutenant who was about my size and had the same color hair. That was why they were so surprised to see me. I was all bandaged up and looked so much like their lieutenant that they thought I was him, come back from the dead. The Aussie soldiers gave me some food but warned me not to eat too much or I'd get sick. Well, I did eat too much and I did get real sick. However, after three weeks of not eating, you can't really eat too much. The Aussies had a radio and asked if I wanted to send a message. Of course I wanted to let my squadron and the Fifth Air Force know that I was safe. I composed a very concise message: "Captain Sullivan, 39th Fighter Squadron, arrived at this point. Injury slight. Please advise." The next morning, there came a reply: "Captain Sullivan will proceed on when able." Some callous, headquarters type must have composed that thoughtless message, because no one in the 39th Fighter Squadron would have been so inconsiderate. I thought, "To hell with them; I'll stay here for the rest of the war; I'll never go back!" Then I decided that I had better return. The Aussies offered to send a native back with me across the mountains. I thought it over and quickly decided against that plan. They also suggested I might go with one of their patrols, which was planning to cross the river, although there was some danger of running into the Japanese. I decided that I had had enough of the natives and that I would go with the Aussies. I was with the Aussie patrol, in their camp, for two days. I felt guilty about eating their food, because everything they had came in on their backs. They had no air drops whatever, but had lugged all of their food and supplies over the mountains. The first night out we saw a big fire. The Aussies thought it might be the Japanese, who would sometimes advance behind the cover of a big fire. As the fire came toward us, I was afraid I had really gone from the frying pan into the fire, but it was much better to be with twenty other guys than to be out there by myself. The threat did not materialize. I don't know who started the fire. The Aussies were awfully nice to me. They even carried my .45, which had become too heavy for me. They realized I was very weak. A couple of big Aussies on either side of me helped me along. Although they had said we wouldn't go too far, we walked about fifteen or twenty miles a day. Eventually, we got across the big river and soon arrived at a camp where there was a small observation plane. We had been walking for two days. The pilot, Lieutenant Frederick, who wore glider wings, said to me, "Captain, I will save you a big walk if you'll get into my little airplane. We'll fly to another airstrip." I agreed and got in. It was a tandem arrangement, so I sat in the front and Lieutenant Frederick sat behind me. We didn't have any parachutes, and the plane didn't run very well. "It always runs better in the air," Frederick said. Famous last words, I thought. Somehow, we took off and flew for a bit. When we got up to about 1,500 feet, he asked if I wanted to fly. I said I would like to try. But when I took control, it felt like I was holding it up in the air with my bare bands, so I gave it back to him. Soon after that, I saw that while the throttle was advancing and advancing, the engine wasn't reacting. Then Frederick announced, "I think we have to turn back." But as he turned it back in a big chandelle, the plane began to lose power. We had been flying over some real tall trees for a long time and I knew first-hand what tall trees could do if you had to crash-land. Fortunately, the trees thinned out and the pilot made a pretty good crash-landing in an open area. But the plane had fixed gear, so when it bit the grass, it flipped over on its back. I was hanging upside down by my seat belt, so I just pulled the buckle and fell about four feet to the ground. Frederick was very solicitous: "Are you all right? Thank God! I'm glad it wasn't the general." It turned out he had been flying an Aussie general around. I fired off three shots - the international emergency signal - waited, fired another three shots, and waited again. Nothing happened, so we walked back to camp. Nadzab and the next day, October 20, I was flown home to Fourteen-Mile Drome near Port Moresby, where a glorious welcome was put on by my squadron. I was back from a thirty-day mission! During the welcome, one dear friend said, "I knew you would make it. Oh yeah, I'll bring back your razor in the morning." I was on cloud nine. I sent a cablegram to my beloved wife, Mareelee, advising her to pay back the insurance money. Ironically, as I learned later, one insurance agent had indeed tried to begin payoff procedures, but Mareelee politely threw him out! I sent a wire to my dear friend, Captain Tommy Lynch, who was on leave in the States: "Bring back my boots, you vulture." Tom had taken my favorite flying boots home with him. Tom was killed later, so I never got my boots. Malaria struck me, which deprived me of following up on a suggestion made by one of the Fifth Air Force generals that I lead a revenge mission against the natives. Actually, my plan was simply to drop supplies to my Aussie commando friends and cause the natives no further harm. I was to direct the mission from a B-25 covered by four P-40 fighters. Before I left Brisbane, Australia, for the States, I was advised that General Douglas MacArthur wished to see me and possibly decorate me. My weakened condition and the questionable condition of my uniforms motivated me to decline. After arriving home, I spent Thanksgiving with Mareelee and our families. Following welcome rest and recuperation, I was assigned to a replacement training unit in Santa Maria, California to teach combat skills in my favorite airplane, the P-38. I was even able to give Mareelee a piggyback ride in a P-38. She literally rode on my shoulders. Charlie Sullivan remained in the service and retired after nearly thirty years on active duty with the rank of Colonel in 1968. In 1973, he added "0" to the family name. In September 1993, he learned that a pair of Australian aviation enthusiasts had located, almost to the day, the remains of the P-38 he crash-landed in the middle of nowhere a half-century earlier.